After our discovery of the self-organized formation of rare earth silicide nanowires on the Si(001) surface , we studied a variety of such nanowire systems in detail. Tuning the rare earth coverage and the thermal treatment, two different (quasi) one-dimensional structures can be prepared, a wire-like wetting layer showing a 2x7 reconstruction as well as free-standing nanowires that often form bunches [2-5]. The nanowire formation is presumably induced by an anisotropic strain in the silicide. 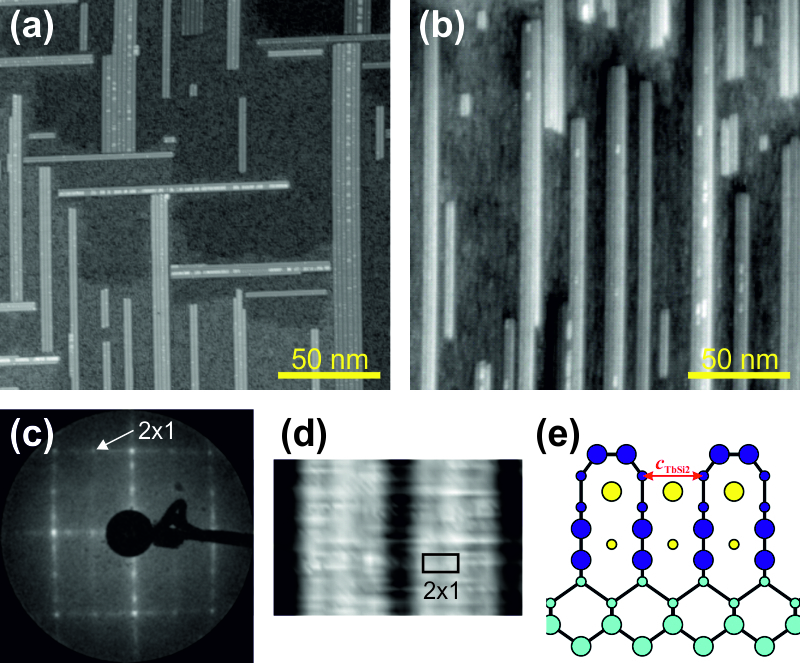 On vicinal Si(001) surfaces, a unidirectional nanowire growth is obtained [2-5]. From ARPES data we found that the nanowires are metallic with a one-dimensional electron energy dispersion [2-4]. On Si(557), which is a vicinal surface of Si(111), also nanowires were observed due to the stepped structure of the Si(557) surface [4,6]. These DySi2 nanowires are characterized by a two-dimensional metallicity, similar to DySi2 thin films on Si(111). This work is currently supported by FOR1700 project E2 of the Deutsche Forschungsgemeinschaft. 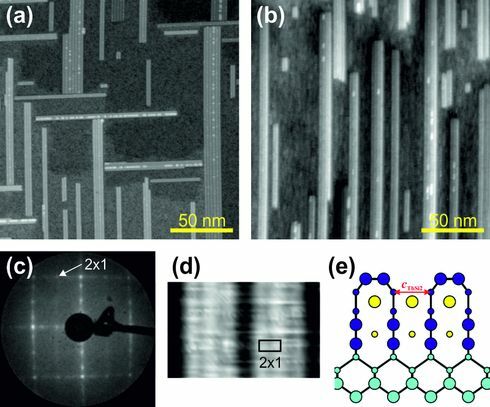 STM images of (a) the 2x7 reconstruction and (b) Dy silicide nanowires on Si(001), prepared at different annealing temperatures . STM images of Tb silicide nanowires on (a) planar and (b) vicinal Si(001). The atomic structure is derived from (c) LEED and (d) detailed STM images, leading to (e) a structure model based on hexagonal TbSi2 with a 2x1 surface reconstruction . 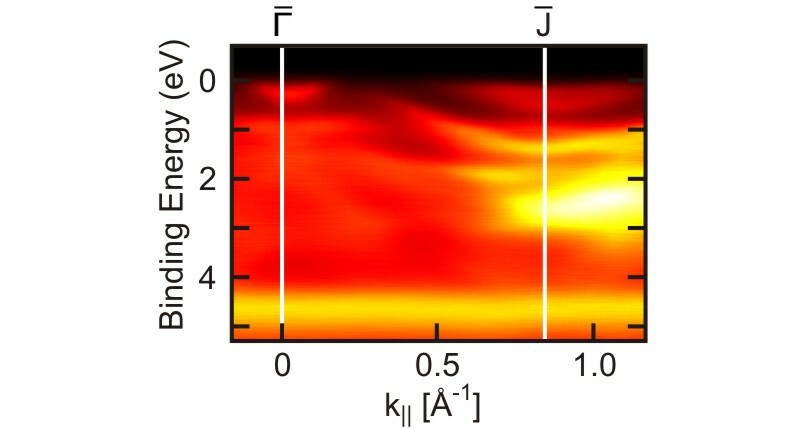 ARPES data showing the electron energy dispersion along the DySi2 nanowires on Si(001) [2-4]. STM image and ARPES Fermi surface plot of the DySi2 nanowires on the Si(557) surface [4,6]. Formation of dysprosium silicide wires on Si(001), C. Preinesberger, S. Vandré, T. Kalka, and M. Dähne-Prietsch, J. Phys. D: Appl. Phys. 31, L43 (1998). Structure and electronic properties of dysprosium silicide nanowires on vicinal Si(001), C. Preinesberger, G. Pruskil, S.K. Becker, M. Dähne, D.V. Vyalikh, S.L. Molodtsov, C. Laubschat, and F. Schiller, Appl. Phys. Lett. 87, 083107 (2005). Electronic properties of self-assembled rare-earth silicide nanowires on Si(001), M. Wanke, K. Löser, G. Pruskil, D. Vyalikh, S.L. Molodtsov, S. Danzenbächer, C. Laubschat, and M. Dähne, Phys. Rev. B 83, 205417 (2011). Metallic rare-earth silicide nanowires on silicon surfaces, M. Dähne and M. Wanke, J. Phys. : Condens. Matter 25, 014012 (2013). Tb silicide nanowire growth on planar and vicinal Si(001) surfaces, S. Appelfeller, S. Kuls, and M. Dähne, Surf. Sci. 641, 180 (2015). Electronic properties of dysprosium silicide nanowires on Si(557), M. Wanke, M. Franz, M. Vetterlein, G. Pruskil, C. Prohl, B. Höpfner, P. Stojanov, E. Huwald, J. Riley, and M. Dähne, J. Appl. Phys. 108, 064304 (2010).